Shirley Elizabeth Taylor, wife of the late John Stanley Taylor, of Oromocto, NB, passed away peacefully on April 14, 2019 at the age of 87 at the White Rapids Manor in Fredericton Junction. Born on October 23, 1931, in Sydney, Nova Scotia, Shirley was the daughter of the late George and Mae Long. Shirley is survived by her children, Robert Taylor, Saint John, NB, Sharon (Elmer) Taylor, Edmonton, AB, Ian (Lynn) Taylor, Fredericton, NB, Sandra Taylor, Lincoln, Ronald Taylor, Mississauga, ON, Patsy (Danny) MacKinnon, Lincoln, NB, Nanci (Darrell) Wojcik, Halifax, NS; grandchildren, Shawna (Chris) Weiss, Lee Ann (Scott) Taylor, Peter (Jennifer) Larsen, Melanie (Tony) Michaud, Jonathan (Natalie) Larsen, Shana (Jesse) Mitchell, Richard (Amy) MacKinnon and Delainey McCarron; and 19 great-grandchildren. She is also survived by her brothers, George (Ruth), Sarnia, ON, Gerald (Mary), Sydney, NS, Jackie, Sydney, NS, Charlie (Anne), Sydney, NS, Cameron and Murray, Hamilton, ON; sisters, Florence (Francis), Ottawa, ON, Louise (Dave), Ottawa, ON, and Virginia (Joe), Brampton, ON; brother-in-law, Donald Taylor, and many nieces and nephews, as well as her very special friend, Lucille Gallant. Besides her parents, Shirley was predeceased by her husband, John Stanley Taylor in 2003. She was also predeceased by her son, David; brother, Robert; sisters, Evelyn Stevens, Vivian Lennon and Lillian Brunet; twin brothers in infancy; brother-in-law, Thompson Taylor, and sister-in-law, Joyce Crawley. 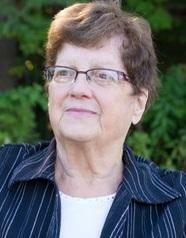 Shirley spent almost 60 years of her life as a resident of the Town of Oromocto and Lincoln, NB where she met numerous friends and was fondly known by many in the area for her good nature and outgoing personality. She loved to socialize with her friends at Tim Horton’s and her favourite restaurant Pizza Delight. She grew up in Sydney, NS within a large family of 13 brothers and sisters. Spending time at her sisters’ cottages on Gillis Lake and the Bras d’Or Lakes where they would play games, share stories, and have a lot of laughs. She married our Dad then they left the island in 1956 and raised a family of eight children. She would visit often and was very proud of her Cape Breton roots. She worked for 25 years for Canex, CFB Gagetown. She was a member of the Ladies Auxiliary Oromocto Legion Branch # 93 and recently received her 20-year pin. She volunteered for the Oromocto Hospital and was very active in the Oromocto Seniors Club. Visitation will take place at the Oromocto Select Community Funeral Home, 108 Winnebago St., Oromocto, NB (506-357-5100) on Wednesday from 3 – 7 p.m. Funeral services to be held on Thursday, April 18, 2019 at 2 p.m. at the Oromocto United Church, 144 Winnebago St., Oromocto with Reverend Lori Beth Sheffield-Bowles officiating. The Oromocto Legion Branch # 93 Ladies Auxiliary will hold Tribute Wednesday at 2:45 p.m. at the funeral home. Online condolences may be made at www.oromoctofh.com.